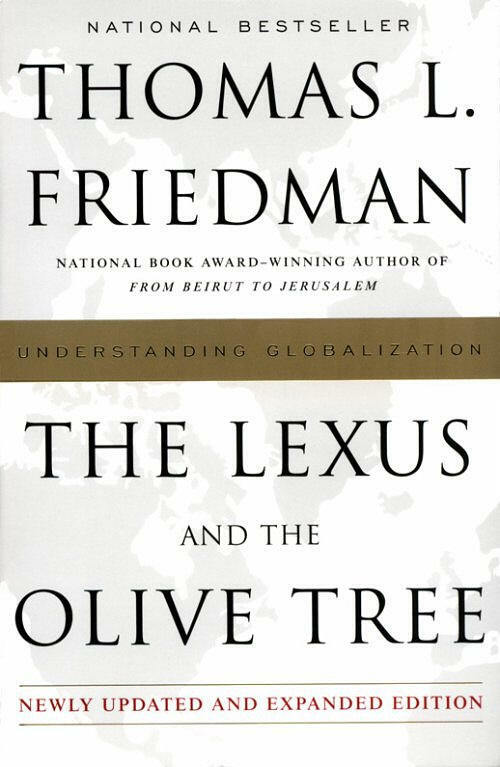 Book Review : The Lexus and the Olive tree: Understanding Globalisation by Thomas L. Friedman » Ambassador Fabian’s blog, KP Fabian, Analyst - international political developments, global issues, Indian national issues. Published by Anchor Books, 2000; $15, pages 490. GLOBALISATION is impacting more and more on our lives, for better or worse, and there are so many books on this. Yet most of us find it difficult to get a grip on it. The title is evocative. The Lexus represents globalisation and the Olive Tree represents tradition, values, history, memories, roots and so on. A good example of the Olive Tree in India (not mentioned by Friedman) will be the controversy surrounding Ayodhya. We need to keep in mind both, the Lexus and the Olive Tree, and the tension between the two to understand our changing world. * Globalisation: It is the inexorable integration of markets, nation-states and technologies to a degree never witnessed before - in a way that is enabling individuals, corporations and nation-states to reach around the world farther, faster, deeper and cheaper than ever before; and in a way that is enabling the world to reach into individuals, corporations and nation-states farther, faster, deeper and cheaper than ever before. * The driving force behind globalisation is free-market capitalism: the more you let market forces rule and the more you open your economy to free trade and competition, the more efficient and flourishing your economy will be. By opening up, deregulating and privatising its economy a country can attract foreign investment. * Globalisation has replaced the Cold War system. The world has moved from a system built around division and walls to a system increasingly built around integration and webs. * Culturally speaking, globalisation has tended to involve the spread (for better or worse) of Americanisation, from Big Macs to iMacs to Mickey Mouse. * Countries most willing to let capitalism quickly destroy inefficient companies, so that capital can be freed and directed to more innovative ones, will thrive in the era of globalisation. The process of globalisation is propelled by the democratisation of technology, the democratisation of information and the democratisation of finance. Friedman has a colourful way of expressing himself. His Golden Arch theory of conflict prevention states that no two countries that both had McDonald’s had fought a war against each other since each got its McDonald’s. Let us look at the argument advanced by the author: “Look at the Middle East (West Asia): Israel had a kosher McDonald’s, which closed five times a day for Muslim prayer, Egypt had McDonald’s and both Lebanon and Jordan had become McDonald’s countries. None of them have had a war since the Golden Arches went in. Where is the big threat of war in the Middle East today? Israel-Syria, Israel-Iran and Israel-Iraq. Which three Middle East countries don’t have McDonald’s? Syria, Iran and Iraq.” Intrigued by his own thesis, Friedman spoke to the McDonald’s headquarters and everybody was delighted to note that there was no negative instance. Then came the Kosovo war, even though there were outlets of McDonald’s in Yugoslavia. Initially, Friedman tried to argue, though without conviction, that North Atlantic Treaty Organisation (NATO) was not a country, that it was not a real war, that it was NATO’s intervention in a civil war and so on. Finally, he thought of a “better argument” since he was sure that NATO was going to win. When the war ended, Friedman rephrased his theory: People in McDonald’s countries do not like to fight wars anymore, they prefer to wait in line for burgers - and those leaders or countries which ignore that fact will pay a much higher price than they think. Elaborating his theory, Friedman recalls Montesquieu’s (1689-1755) theory that international trade had created an international “Grand Republic” and that “two nations who traffic with each other become reciprocally dependent; for if one has an interest in buying, the other has an interest in selling; and thus their union is founded on their mutual necessities”. Montesquieu further postulated: “Happy it is for men that they are in a situation in which, though their passions prompt them to be wicked, it is, nevertheless, to their interest to be human and virtuous.” Friedman clarifies that the reference to the Golden Arches of the McDonald’s, is not to be taken literally and that what is implied is that once a country has a middle class of a size large enough to support a chain of McDonald’s that country is not going to fight another McDonald’s country. * Yugoslavia did not go to war with the United States or the NATO, it was attacked, it did not even fight back. Hence, the NATO military action is neither proof nor disproof of the Friedman thesis. * The Montesquieu thesis has been decisively disproved by subsequent European history. * There are two principal forms of war in our times, civil wars and the wars of U.S. intervention in the rest of the world. By Friedman’s own admission his thesis does not apply to civil wars. Does it apply to the second category? Does the Pentagon or the White House take into account when such war-related decisions are taken the number of Golden Arches in the targeted country or the size of its middle class? * Let us critically examine the argument “Where is the big threat of war in the Middle East today? Israel-Syria, Israel -Iran and Israel-Iraq. Which three countries in the Middle East don’t have McDonald’s? Syria, Iran and Iraq.” Is the argument logical? Apart from the absence of the Golden Arches in the three countries, what else do they have in common? They have an adversarial relationship with Israel. Why? There are many reasons, but the brazen, U.S.-supported state-terrorism of Ariel Sharon directed against the Palestinians has to be included in any serious explanation of the state of tension and the danger of war in West Asia. Neither Ariel Sharon nor the U.S. factor into his/its calculations the size of the middle class in the countries Israel has hostile relations with. * In support of his thesis, Friedman quotes a story carried by USA Today on July 8, 1999: “Zoran Vukovic, 56, a bus driver in the city of Nico, earns the equivalent of $62 a month, less than half his salary before the war. The Serb government laid off almost half of the roughly 200 drivers last month. The rest had their salaries slashed. With the state controlling the price of food, Vukovic and his eight dependents can survive. But most extras are out of the question. ‘McDonald’s is now only a dream,’ says Vukovic, who used to take his three grandchildren to the Belgrade outlet. ‘One day, maybe, everything will be O.K. I just don’t think it will be in my time’.” Friedman has a tendency to confuse between a good, appealing human-interest story and a logically tight cause and effect argument. TO what extent is globalisation just another name for Americanisation? Friedman narrates the story of five gas stations: First, the Japanese one, where gas is sold at $5 a gallon, with four men in uniform and white gloves, with lifetime contracts, waiting on you; second is the American one, only $1 for a gallon, but you have to pump the gas yourself; when you drive around, four homeless fellows try to steal your hubcaps; third, the West European gas station, again $5 for a gallon, with only a grumpy man on duty; he works only 35 hours a week and across the street his uncle and two brothers, on unemployment dole for ten years, are playing boccie ball; fourth is the developing country gas station, with 15 people working there, but no one to pay attention to you when you drive in as they all are talking to each other; though the state-subsidised gas is only 35 cents a gallon, only one of the six pumps is working; and last, there is the communist gas station, only 50 cents a gallon, but no gas is available as the employees have already sold all of it for $5 a gallon. Friedman says the whole world is coming to the American gas station. By and large Friedman is right in what he says about Americanisation. But he does get his facts wrong at times, as when he says that some countries “sit back and enjoy the role of the free rider - they let America be the global sheriff, pay all the costs of confronting the Saddam Husseins and other rogues, and enjoy the benefits, while all the time complaining about America.” The U.S.-led military action against Iraq cost the Pentagon over $70 billion, almost all of it was paid by Saudi Arabia, Kuwait, the United Arab Emirates, Japan, Germany and others. A colourful, but insightful phrase of Friedman’s is the Electronic Herd. He means those who sit in front of their personal computer (PC) and with the click of a mouse transfer millions of dollars from one company to another, or from one country to another. The central banks and governments are powerless against the Electronic Herd. Another memorable phrase is the Golden Straightjacket, meaning that the government of a country has recognised that the market forces have to prevail. Is globalisation irreversible? Friedm- an’s answer: “Almost irreversible.” He fears that if some very large states such as Russia, China and Japan find it too painful to put on the Golden Straig- htjacket, then globalisation might be reversed. It should distress Friedman that it is the U.S. which has decided to impose stiff duties against foreign steel, a decision which, it is feared, might trigger a nasty trade war with the European Union. In fact, the global excess capacity in many areas, for example in steel to the tune of 200 million tonnes per annum, is not even mentioned by Friedman while discussing the prospects of globalisation. Nor does he mention that the European Union and the North American Free Trade Agreement (NAFTA) are truly regional arrangements standing in the way of globalisation. It does not occur at all to Friedman that a Cambodian or a Peruvian or even an Indian might compare globalisation to a race in which cars such as Italy’s Alpha Romeo, India’s Ambassador, dozens of bicycles and scores of bullock carts are called to participate and that there might be some basic absurdity in the very design and concept of the race itself. Friedman ends on a note of high praise for America, “a beacon for the whole world” and a model for others in balancing the Lexus and the Olive Tree. This book will be useful to anyone who wishes to have an American perspective on globalisation. The importance of correctly understanding the American perspective in our world perceived as irrevocably ‘unipolar’ by many within and without India cannot be overestimated. The personal loans seem to be useful for people, which are willing to start their own organization. By the way, this is not very hard to get a student loan. It’s cool that we can receive the loans moreover, that opens up new opportunities. Great review, although globalization is indeed spelled with a “z”.